Mardi Gras is Tuesday, March 4th. You may not want to celebrate Mardi Gras in the traditional way, with Cajun and Creole cuisine, a King Cake and long strands of party beads. But you can serve classic New Orleans cocktails like the Hurricane, which has its own special hurricane lamp-shaped glass; or the Sazerac, the official cocktail of New Orleans; a combination of cognac or rye whiskey, absinthe and bitters. Or, you can whip up a menu of cocktails in Mardi Gras’ theme colors of purple, gold and green. But when applied to colored cocktails, they represent a good time. Thanks to Hendrick’s Gin for providing this idea, along with a Purple Basil Gimlet recipe below. A Purple Haze from Pom Wonderful. In the background, a Midori “Cosmopolitan”. Photo courtesy Pom Wonderful. 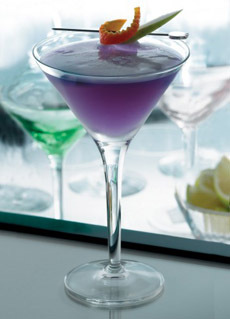 We’ve made suggestions for purple, gold and green cocktails; you can easily find many recipes online. We’ve made simple cocktail suggestions below, e.g. vodka with a green liqueur. But you can add more ingredients, as long as they don’t decrease the intensity of the color. Juice. Mix a clear spirit with currant juice or grape juice. Drinks with pomegranate juice (e.g., a Pomtini) can work, but they made need a touch of blackberry liqueur or blue Curaçao to make them more purple than red. Liqueur. Add a touch of blackberry brandy, Black Sambuca, crème de cassis, grape schnapps, liqueur de violette or Parfait Amour, a purple liqueur based on Curaçao. Soda. Add your favorite clear spirit to grape soda (one of our college favorites was Purple Passion, vodka and grape soda). Vodka: Check out UV Purple Vodka, colored purple. Food color: Color anything clear or white with these formulas from McCormick(25 drops equal 1/4 teaspoon food color: purple = 150 drops neon purple + 30 drops neon blue, gold = 100 drops yellow + 5 drops red; green = 150 drops green, 6 drops black. Make mocktails with lemon-lime or club soda. Bellini & Mimosa. Almost everyone will be happy with these two famous yellow cocktails: Bellini (peach purée and sparkling wine) and Mimosa (orange juice & vodka), both bright and opaque. Juice. Blend any clear spirit with mango juice, orange juice, peach nectar or pineapple juice. Liqueur. Blend any clear spirit with Limoncello or Galliano; the most famous Galliano drink is the Harvey Wallbanger. Other yellow liqueurs include Chartreuse and Strega. Martini. 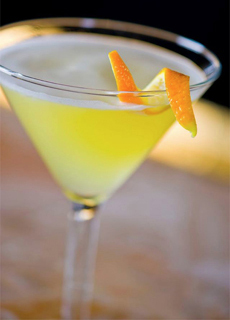 Try a Lemon Drop Martini (1-1/2 ounces vodka, ideally citrus-flavored; 1/2 ounce orange liqueur, 1 teaspoon superfine sugar, 3/4 ounce freshly-squeezed lemon juice). Vodka. UV Vanilla Vodka has a light yellow hue. Grasshopper. This minty chocolate cocktail classic consists of 3/4 ounce cream, 3/4 ounce white creme de cacao and 3/4 ounce green creme de menthe. Shake with ice and pour into a Martini glass. Liqueur. Anything with Midori melon liqueur or apple schnapps, both of which have a bright green color. Other green liqueurs include absinthe, green chartreuse, green creme de menthe and TY KU liqueur. Martini. An appletini with sour apple schnapps. The more schnapps, the greener. Vodka. UV Apple Vodka, which is made with a bright green color. Add a garnish in a different Mardi Gras color from the cocktail. Purple Garnish: blackberries or blueberries on a cocktail pick; a cube of purple Jell-O (make gelatin in a pan, cut in garnish-size squares, place on picks and freeze). Gold/Yellow Garnish: cape gooseberry, lemon curl, orange peel, pineapple, yellow Jell-O cube. Green Garnish: basil leaf, mint leaf, rosemary sprig. Press purple basil leaves with simple syrup and fresh lime juice, add Hendrick’s Gin and shake well, strain up into a stemmed glass, garnish with a sprig of purple basil.